Bellafill is the only dermal filler that stimulates collagen growth long term to help maintain your youthful appearance for up to 5 years. Sooner or later you notice facial aging catching up with us all. Often you are not sure where to start or what's available and perhaps you are not ready for surgery. Fillers are a great start to re-volumizing the face and reducing the signs of aging. Bellafill is the longest lasting filler on the market and keep in mind that fillers offer instant results. WHAT IS BELLAFILL? BELLAFILL is different as it is unlike most fillers which don't last as long. The FDA gave approval in 2006 and this product is widely used all around the globe. BELLAFILL is a smooth, collagen gel-based dermal filler that contains tiny PMMA microspheres. The collagen gel provides immediate volume and lift to correct lines and wrinkles, smoothing them away for instant results. BELLAFILL is a non-surgical dermal filler and treatment only takes about 30 minutes depending on area and loss of volume. IS BELLAFILL RIGHT FOR ME? BELLAFILL is for wrinkle correction for your "smile lines" often known as Nasolabial folds. Bellafill can be used for structure and support in areas where loss of volume, lines, wrinkles and Acne scars. Discuss with Dr. Lyons if this product is right for you. HOW LONG DOES IT LAST? Studies have shown to last over 5 years. 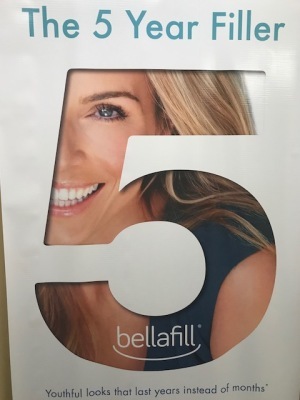 WHAT MAKES BELLAFILL DIFFERENT FROM OTHER FILLERS? Bellafill is different because most fillers are absorbed by your body losing their effect over time but this product in addition to adding structure and support encourages your skin's natural production of collagen, stimulating long-lsting results. HOW LONG DOES IT TAKE FOR A TREATMENT? Usually less that 30 minutes depending upon the area and loss of volume. Want to get long lasting, faster results with less visits for re=treatment then consider Bellafill.